our little fall pleasure to enjoy with family and friends! Thanksgiving is just around the corner and for us it’s the time to chill after the busiest time of the year, the Harvest season! After a beautiful summer, this “vendemmia” (grape harvest) was very productive and, like the best years, really required a huge effort but we are sure it will translate into some of the finest wines of the latest vintages. No matter the hard work, for us the harvest season is a great tradition and a ritual after which we like to spend the quiet time to focus on new projects and enjoy the beautiful landscape that surrounds us. The mood is so delightful and nature around our country estate simply invites to celebrate the people and things that we are most grateful for! Having lived in the U.S.A. for more than 10 years, Thanksgiving is one of our favorite celebrations! We like to match this wonderful Holiday with our Italian tradition, and we have a tip for you, always start with an Aperitivo! 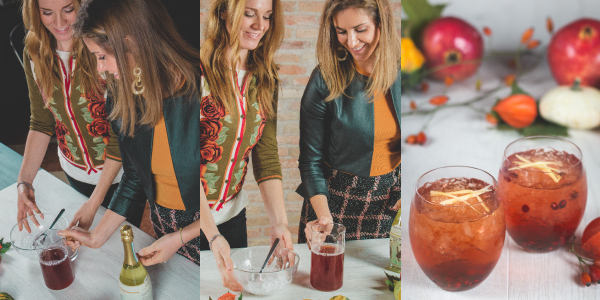 As you may know, Italian Aperitivo is a tradition – click here to learn more – and we think it’s really the best way to welcome and entertain your guests. Whether it’s a family gathering or a simple dinner with friends, the Aperitivo it’s just the perfect way to put everyone in a good mood and kick start the event. You can either prepare the cocktails yourself or set up a cocktail station for your guests to help themselves, prepare the ingredients, the glasses, whatever cocktail barware you have and as many add-ons you like such as: cinnamon, herbs and ginger garnish, just to name a few. 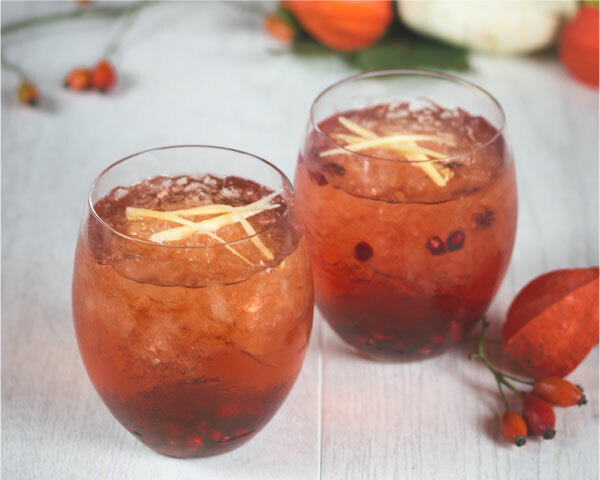 We believe we have the perfect cocktail for Thanksgiving to share with you, the Candoni Red Passion Cocktail! It’s like the Holiday fun in a glass…and we think it’s pure perfection…fizzy, gingery, full of sweet pomegranate, and Prosecco too! A must-try for any Holiday get-together. You can also see us prepare this cocktail on our Facebook and Instagram pages. Fill a shaker with 1 part liquid sugar, 2 parts pomegranate juice, chopped ginger, and shake. Fill the glasses with the chopped ice, pour the liquid and top with Candoni Prosecco. Add a spoon of pomegranate seeds and mix to obtain the perfect ruby red color. And to garnish your cocktail, add some ginger strips. (Peel the ginger and slice very thinly, then stack the slices and cut them into the same size strips). Download now, to learn our Italian family’s recipes, wine pairings and menus! ➡️ Read more about our initiative.